A dynamic and passionate innovator, Ruth Lande Shuman is an award-winning industrial designer deeply committed to using design to address two of the root causes of poverty: the under-education of our youth and their lack of job preparedness. Ms. Shuman received her B.A. in 1964 from the University of Pennsylvania and completed her M.S. in Industrial Design at Pratt Institute in 1989 with a thesis on “Modular Forms, Patterns, and Systems in Nature,” where she also completed a six-month post-graduate study on the psychological effects of color. A pioneer in using design to engage disaffected youth in their education, Ms. Shuman set her sights on improving the lives of neglected NYC public school students, their teachers, families and communities. Alarmed by low test scores and high drop-out rates and appalled by the dreary and often prison-like facilities that operate as our middle and high schools, Ms. Shuman hit on the deceptively simple—yet incredibly successful—idea that one can fundamentally improve students’ attitudes and engagement by improving their learning environments. 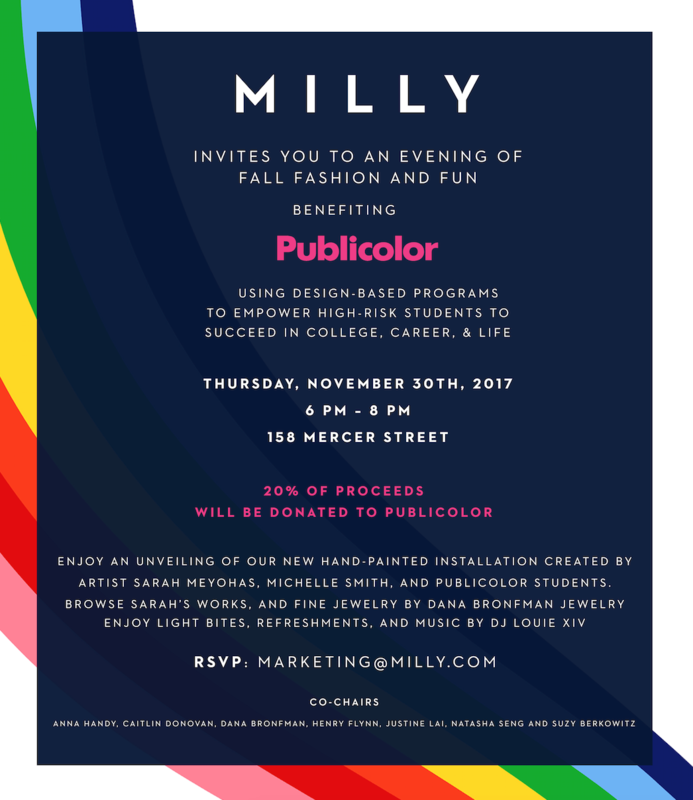 In 1996, Ruth Lande Shuman founded the not-for-profit organization Publicolor to use color, collaboration, design, and the discipline of the commercial painting to engage at-risk students in their education, targeting the most underserved communities, most underperforming schools and most seriously disadvantaged middle and high school students. She quickly realized that lasting change requires an intensive and long-term commitment. As a result, she created COLOR Club, Next Steps, and Summer Design Studio to ensure that students are with us a minimum of 3 days a week for 4-6 years before college, and then all through college. She is very proud that out of a full and part-time staff of 41, 14 are Publicolor graduates. Ruth firmly believes that every student is walking potential, and that it is our job to help them realize it. She is surrounded by a team who wholeheartedly shares this view. Ms. Shuman has been deeply committed to community-based volunteer work for over 30 years, most notably as a founding trustee of the Big Apple Circus, where she served as an active board member for 17 years. She is a former trustee of the Rowena Reed Kostellow Fund at Pratt Institute, the Women’s Council at the University of Pennsylvania, the Mayor’s Voluntary Action Center, and The Kitchen, a preeminent presenter of contemporary performing arts. She was a member of the Union Free School Board of the Wiltwyck School, Ossining, NY. Ms. Shuman also served as the Mayor’s representative to the board of the Museum of Art & Design in New York City. Prior to founding Publicolor, Ms. Shuman assisted renowned designer, Gaetano Pesce, on projects in Japan and France. She also coordinated a large design exhibition and the accompanying award–winning Abrams book, “Mondo Materialis” for Steelcase Design Partnership. The exhibition traveled to major museums in the United States. The MILLY collection epitomizes bold, advanced contemporary fashion with a feminine edge. Designer Michelle Smith transforms classic silhouettes by merging American sportswear influences with distinctive Parisian atelier techniques. Smith’s eye for impeccable detail, use of luxurious, cutting-edge fabrics and precise tailoring have made MILLY a cult favorite across the globe. Convinced from a very early age that fashion design was her calling, Smith earned a scholarship to Moore College of Art and Design to study fashion illustration. She later followed her passion to New York’s Fashion Institute of Technology. Smith worked at the Hermés boutique in Manhattan to help fund her tuition. Upon graduation, she wrote to the President of Hermés requesting an internship at the Paris headquarters. Her request was granted, making Michelle Smith, the first American Hermés employee sent to work in Paris with the legendary fashion house. MILLY has successfully expanded into categories beyond ready-to-wear, including MILLY handbags, MILLY small leather goods, Special Occasion, MILLY Cabana swimwear, and for budding fashion lovers, the MILLY Minis childrenswear collection, largely inspired by Michelle Smith’s daughter, Sophia. MILLY ships to 150 countries worldwide, including four free-standing MILLY boutiques in the Middle East to complement flagship boutiques in Tokyo and at 900 Madison Avenue in New York City as well as a boutique at 54 Main Street in East Hampton, New York. Shop Michelle’s favorites.